Finding the right gift for new parents can be tough. Go to Amazon and look up baby products and you'll soon become overwhelmed by how many options there are, and how much prices vary. You can find something great for $20 but feel like it's not a substantial enough gift, or find some overpriced gift for $100 and think it's a piece of junk! You might also be shopping for last-minute birthday or Christmas gifts, which will stress you out a bit more and you'll need reliable 1- or 2-day shipping. We highly recommend using Amazon Prime for last-minute gifts, as they have a great track record of shipping on time and getting delivery dates right, even during busy holiday times. Two-day shipping is free, and one-day shipping is only a few dollars more. Last year we ordered 4 gifts on the 22nd of December, and they made it on time on the 24th without any hiccups. They'll also include a free gift note, and wrap it for you for a small fee. For our larger gift guide, click here. To make this list of Best Baby Gifts under $50, we tested and reviewed some of the most popular 2019 baby gifts, and came away with some truly great options. Best Gift Ideas under $50 for 2019. You can't go wrong with the Best Rated Baby Products on the Market! Each of these 4 options is about $40-50. First is the awesome Podster Infant Lounger, which is an awesome alternative to a baby bouncer or swing. This super portable and amazingly comfy lounger can go anywhere with mom - to the kitchen, dining room, bedroom, and bathroom. Second is the VTech Sit-to-Stand Alphabet Train, which is a fantastic way to get a little one to start scooting around the house and driveway. 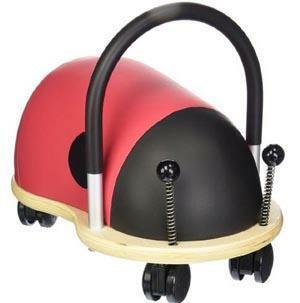 Babies start by enjoying the fun knobs and buttons on the side, then graduate to sitting and scooting on it, then finally to standing behind it and pushing. An awesome, long-lasting toy that any baby will enjoy! Third is the #1 best-selling baby gym of all time, the Fisher-Price Deluxe Rainforest Gym, which is always a clear winner. Want an option better suited for girls? Check out the adorable Fisher-Price Piano Gym. Finally, fourth is the awesome Boba Baby Wrap, which is beating out the top-selling Moby Wrap as the best rated new baby wrap on the market. Soft, lightweight, super versatile, and stylish, this is the wrap to have for 2019! 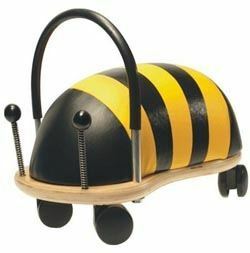 Adorable Wheely Bug Ride-on Toys! These make an awesome and adorable Christmas gift idea. Being stuck inside during freezing cold days can challenge even the most creative of parents! 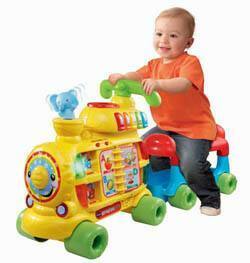 These ride-on toys are super fun, durable, and safe for little kids. They range from just under $50 for some animal options, and a bit higher for some others. They come in two sizes: small or large. Small is suitable for kids from about 16 months up to about 3 years. The large size is suitable for 3 years and up. If the toddler is always in the 90th+ percentile for height and weight, you might want to consider going with the large size. We got 3 of these to test out with a bunch of kids ranging from 17 months to 4 years of age. The kids raced around on them, sat on them during popsicle time, and generally used them to burn energy. We're going to keep these around for the winter months! This is an awesome Christmas gift idea for under $50, that the little ones will definitely love! The $45 BathtimeTriple-Play! Here are three products that will make bath time tons of fun. Each is about $15, keeping the total tab just under $50. First is the Munchkin Inflatable Safety Duck Tub - an awesome bath time gift for babies who are ready to sit up (usually around 4-6 months) and have some fun during bath time. 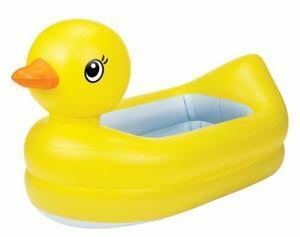 Rather than having your baby continue to lie down, this inflatable duck tub allows him/her to sit up and enjoy a cute padded big yellow duck design. 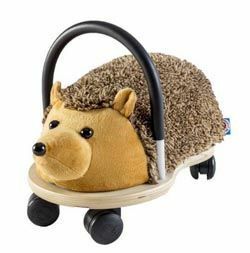 Not only do babies love this silly thing, but it also helps the problem of the baby sliding all over the seemingly giant tub, by keeping them in a small supportive space with a textured bottom. It has a color-changing water temperature indicator on the bottom that helps parents know when the water is just the right temperature for baby (the circle turns white when the water is too hot). In addition to using this at home, it's also great for travel. Deflate it and pack it away, and you can make any bath tub or shower cleaner and more fun (like at a hotel where you're not sure exactly how clean that bathtub bottom is!). Pro-tip: you can also use it as a sled! 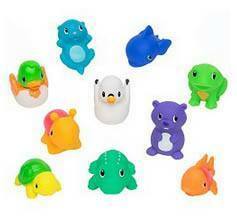 The second $15 Christmas gift idea in this BathTime set is the Munchkin Squirtin Lake Buddies Bath Tub Toys, which includes 10 little squirt toys that match wonderfully with this duck bath tub. Squeeze them underwater and fill up their tummies, then squeeze them out of the water to squirt water from their cute little mouths. There's a frog, turtle, alligator, fish, and of course a little duck. They come stacked in a cute little tube that holds all of them snugly. 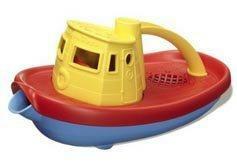 Finally, the third $15 Christmas gift idea in this BathTime set is the Green Toys My First Tugboat, which is an adorable and multi-purpose little tugboat that babies love! Made from recycled milk jugs, this little tugboat floats right on top of the water and doubles as a pitcher that you can fill with water and dump out of the front spout. Old fashioned fun for babies 6 month and up! The Feeding Frenzy Three-fer! Here are three adorable products that are both cute and highly functional. One is $20, one is $12 to 30, and the third is $10, making for an awesome and thoughtful gift for under $50. 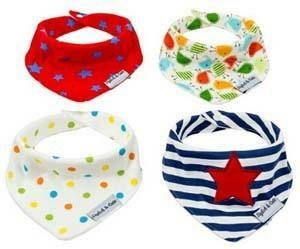 First is the Baby Bandana Bibs for Infants and Toddlers, which is one of the highest rated overall baby gifts online. And for good reason, these bandana bibs are super cute with quality stitched designs, snaps instead of velcro, and high quality fabric. You get 4 different ones for under $20. 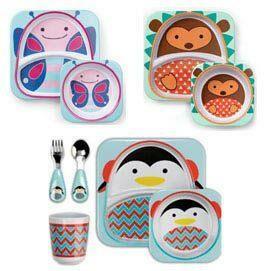 Second is the Skip Hop Feeding Set, which comes in a ton of awesome designs. Depending on which one you pick, prices range from about $12 up to $30. The cheaper ones come without the cup and utensils. These plates are awesome, and if you get a bunch of different animal varieties they will stack onto each other (they are all the same overall shape even though the pictures differ). They are dishwasher safe and kids love them! Third, if you haven't spent all your money on a bunch of Skip Hop sets, is the Brinware Silicone Placemats with ABC and 123 designs. 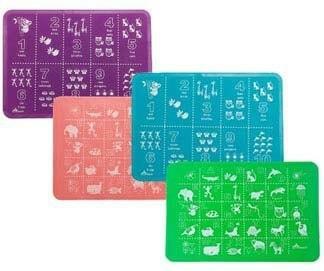 These are great, washable, and easy to use placemats, with fun educational designs. They are quite large (15" x 11") and roll up easily for portability. They come in boy (green and blue) and girl (purple and pink) colors, and cost about $15 for a 2-pack. Together, these 3 gifts are super functional and cute options for a great price! Awesome 19-piece Set of Gerber Onesies, Sleep n Plays, Gowns, Hats, Receiving Blankets, and Bibs. These are very popular for holidays and baby showers, the big baby-boy and baby-girl Gerber gift sets are always appreciated by new parents. They come with awesome 0-3 month and 0-6 month articles of clothing to suit the style and taste of even the pickiest parents. There's nothing like the Gerber onsies and hats for comfort, softness, style, and functionality. The clothing pieces are all 100% cotton and super soft. For a 19-pack of necessary baby clothes, this is a great deal coming in at just about $50 for the boy or girl versions. 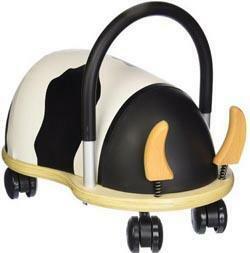 Sold separately, these come in at around $70 at your local Babies R Us, so you'll save a bit by going through Amazon. Plus they offer free returns (including free return shipping) and fast 2-day shipping. The Best Travel Trio for Road Trips and Getaways! Traveling is a giant planning and organizational hurdle for new parents. Not to mention all the hassle of trying to find clean suitable places for feeding and diapering, and feeling safe and comfortable in the car. This travel trio helps all of these situations. First, it includes an awesome seat-back organizer for the car, a great place to keep all the car trip essentials: wipes, pacifiers, rattles, toys, books (check out our reviews of the best baby books), and even a bottle. 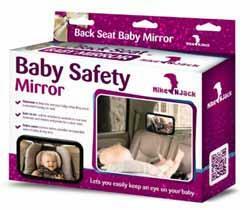 Second, it includes a rear seat head-rest mounted mirror to help mom, whether driving or passenger, see their rear-facing baby. This is a great way for parents to stay confident their baby is safe and comfortable in their seat. Finally, we also include a great travel clutch that unfolds into a perfect-sized fashionable and practical changing pad clutch that helps parents keep their babies safe and clean in even the most unfortunate of places! Together, this travel trio will set you back only about $48 with free 2-day shipping from Amazon Prime.